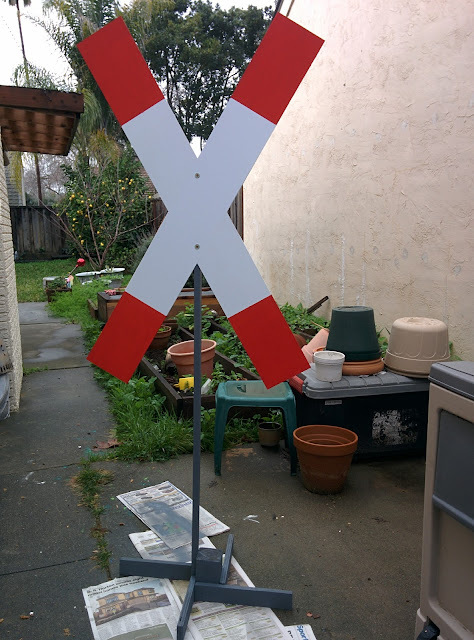 I built this railroad crossing sign, "Andreaskreuz" in German, from strips of 1/16 inch styrene sheet. There are two layers glued together. Each of the two arms is 4 feet long, which works out to 90% of prototype size, so I scaled down the width accordingly to keep the correct proportions as specified in the EBO, Anlage 5. Das sieht super aus! Man koennte glauben, Du haettest das irgendwo abmontiert!